The wait to see the long-awaited first device from OnePlus is finally upon us. The company has unveiled the phone tonight at 11:30 pm PST. It might still be April 22nd here on the west coast but it’s morning in China where their showing off the device. Up until now we had only seen renders and possible leaked screenshots of what we thought to be the phone, and we have seen plenty of teasers from the company mocking other OEMs for their flagship designs, choices of specs and everything else in between. We have heard all the important specs from the manufacturer themselves at this point. At least on paper, the OnePlus One seems to have quite the leg up on the competition according to the hardware. The device is coming packed with a 3,100 mAh battery, which is more than most of the other flagships out their that compare in the same category. It even has the same processor as the Samsung Galaxy S5, and has 3GB of RAM to the S5′s 2GB, and all for under $400. At least for one of the models. According to the leaks earlier this evening, the potential pricing for the OnePlus One was thought to be around $353 for the 16GB model of the phone, and $417 for the 64GB model of the phone, although those prices were only speculative at the time. It may sport a camera sensor with less MP than the Galaxy S5, but thanks to the Sony sensor with built in Exmor RS technology, OnePlus has reportedly been able to pull 50MP quality images out of the camera. According to the sample shots we’ve seen in recent weeks, the picture look pretty good but we’ll wait to see how they stack up side by side with some of the other top flagships. We also got our supposed first look at what the software and UI should look like, which will be an iteration of the Cyanogenmod custom android firmware and based off of Android Kit Kat, called Cyanogenmod 11S. The official specs as shown by OnePlus during their live event this evening shows that the phone indeed has 3GB of RAM, a 5MP front facing camera, a 13MP rear facing camera that carries 6 lenses and an f/2.0 aperture, a Qualcomm Snapdragon 801 CPU clocked at 2.5GHZ, the 3,100 mAh battery that we discussed earlier, support for 2G, 3G, and 4G LTE bands, WiFi 2.4G/5g 802.11b/g/n, and Bluetooth 4.0. Of course who could forget about the display, which measures in at a cool 5.5-inches, making the OnePlus One the lightest 5.5-inch device in the world due to its 162g of weight and magnesium makeup. We can also confirm that the leaked images we saw of the device days ago, were in fact of the actual design. As you can see the device actually does sport some of the smallest bezels of any phone out there currently, with what OnePlus is actually referring to as a recessed bezel, revising it to a mere 0.07mm thin, making it virtually unnoticeable to users. Seriously.. these bezels are thin. 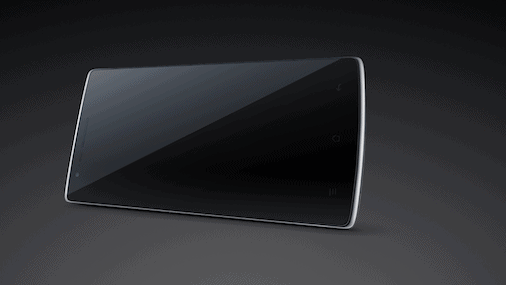 Not only are the bezels thin, but the phone itself is thin, measuring at only 4.6mm thick. So far, we’re pretty happy with the design of the phone and so is the team at OnePlus, even though they seem to have one regret, which is the lack of metal borders due to signal and weight issues they said. That’s just fine with us, because this phone looks amazing. The OnePlus One will be available in two initial colors and textures at launch, in either a sleek sandstone black, or a lush and beautiful silk white. What’s interesting is that OnePlus has not only given us two great looking color choices for the devices, but the back cover finish is apparently made of cashew, which won’t necessarily come in handy in case you left home without your lunch, but it’s cool to know that OnePlus has found an interesting way to utilize renewable resources like food for the materials in their phone. Not too keen on the white or black colors with the cashew back finish? No problem, because the leak we saw earlier in the week about the StyleSwap colors was true, and OnePlus will also be offering alternate back cover finishes in Denim, Kevlar, Bamboo, and Wood, so there should be plenty to suit just about anyone’s taste right away. The StyleSwap covers are like OnePlus version of the Moto X custom backs. With all of the other flagships already having been released, we can safely say that we’re glad the OnePlus One took its time with the release, as something this elegant and perfected deserves to own the spotlight without interruption. Think the HTC One M8 has it beat on the audio side of things? That may not be the case, as the OnePlus One also sports stereo speakers, but on the bottom edge, making it the worlds first device with downward facing stereo speakers, engineered by JBL for superior quality sound. So how much does the phone cost? cause we know that’s what you’re all waiting for. The phones unveiling is still developing, so we’ll keep you updated as the prices are listed. The post OnePlus Announces The OnePlus One, The Worlds Lightest 5.5-Inch Android Phone appeared first on AndroidHeadlines.com |.